If you've recently painted or renovated your kitchen, some of your major appliances, like your oven or dishwasher, might not blend well into the new color scheme. You might have just always hated the color of your oven, particularly if it has a garish, very vintage color like olive or gold. You don't need to spend buckets of money on a new oven just because you don't like the color. 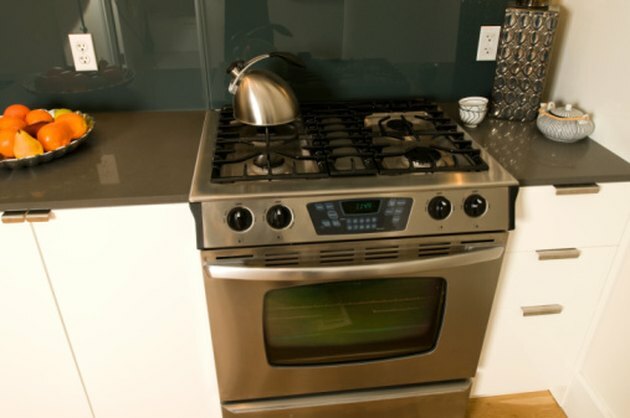 You just need some appliance paint that can lock onto the enamel or porcelain finish of most ovens and withstand the extreme temperatures without flaking or peeling. Not all ovens come in shades their owners love. Check to make sure your oven is off. Put on a pair of rubber gloves. Pour 1/4 cup trisodium phosphate into a bucket with 1 gallon water. Dip a scrub brush in the mixture and scrub down the exterior door of the oven, removing caked on dirt and grime. Rinse off the exterior of your oven with clean water. Rub a sheet of aluminum oxide sandpaper in a coarse grit all around the exterior of the oven, roughing up the previous finish. Run a vacuum cleaner over the surface area of the oven when finished to remove the dust from sanding. Apply painter's tape to all the areas along and around the oven where you don't want to get paint. Spray the oven door with a light coat of appliance primer. Allow it to dry for 12 hours. Follow with a coat of appliance spray paint. Allow it to dry for 24 hours and repeat with another coat, allowing it to dry for the same amount of time. What Can I Put Between a Stove & a Refrigerator?